The game has reached its Esports peak - if the requirement for Esports is high CPM and arcade game like reflexes, that goal has now been reached. Wrong moves are punished instantly and completely. Squad wiping and chasing or cutting off retreats is meta. Even with an assault squad, it's really risky to charge a unit in green cover unless you have elite infantry (MP40 volks and such will never survive crossing red to assault something in green, for instance.) So you need to blob. All the time. Harassment. Flanking to a large extent. Moving around the map and setting up complex 3 or 4 unit flanks from different directions. Something is going to get caught, and will be forced to retreat before it gets into position, if not wiped. Why flank and risk losing a unit to focus fire when you can use indirect fire? Attacking needs to be done with tactical battle groups, aka, blobs. And of course, having a good time. I enjoyed being outmaneuvered by better players and learning from them, I do not enjoy losing because my reaction time is a bit slower. There aren't enough audio cues in the game, and the ones there are don't always fire. So who wins? Fast multitasking screen switchers. There is NOTHING more important than unit preservation in the game, because frankly, in most games, resource income doesn't really matter. If you're destroying your opponent and have all the fuel, then you've already won and the the tank a little bit sooner is just icing on the cake. Yes, you still have to fight for them but there is no strategic depth to the game, only squad preservation. It wasn't always like this - the "weapons profile" patch generally increased damage across the board, and ever since then it feels like the DPS has just risen higher and higher with each patch. I don't remember which patch did it, but units not surviving retreats is a lot, lot more frequent, and I think that was more recent. As I remember, people wanted the infantry fights to go faster, but I think there was a middle ground that was missed. If nothing else, I'd really like to see a future patch give higher retreat bonuses to units. Just let people learn from their mistakes, they will still get outplayed, but they won't quit in 5 minutes because penal blobs wiped their stuff on retreat. That's why people quit games, folks, the game is just too frustrating. And good players know a squad wipe or two early is GG, you don't come back, not at a high enough skill level. I'm afraid, that destination was the only one possible, bearing in mind how CoH2 core concepts are oversimplified comparring with CoH1's ones (fixed popcap, the only way to gain veterancy, no repair costs, etc). It just reminded me of DoW2 with it's Dota-like vibes. Of course, the game was meant to be more casual when it was developed to be more casual. And I don't think you can settle on a single rule when playerbase is this incoherent. Personally, I doubt we will see more lethality in CoH3. Because there is CoH2 playerbase - those people, who didn't leave or was attracted by sales, when CoH2 flaws and Relic's attitude toward them became obvious. It's more about the marketing, I think: either you keep a devoted playerbase and expand the game by selling premium content, or have all those precious lootboxes, paid articles in PC gamer - anything that makes 1-time appeal for a 1-time buy, multiplied on marketing's quality. I can't express how much I'm in agreement with your opinion in this thread, but I can't feel anything good, knowing that we are official minority with how Relic approached on promoting CoH2.. so a word of advise - don't expect from CoH3 too much now. It's better to be neutral now than to be disappointed afterwards, I suppose. Totally agreed. I been commenting about Relic esport push since dawn. You put it in great words. If anything DOW2 weakness and DOW3 flop should be a clear warning. To be fair, vCoh2 beginning was even worse than today. Maps design were lacking, cover/flanking even more pointless, camera was panned too close, TTK was even higher IIRC. But while Relic have patched vCoh2 up till today, some original designs were impossible to patch out. 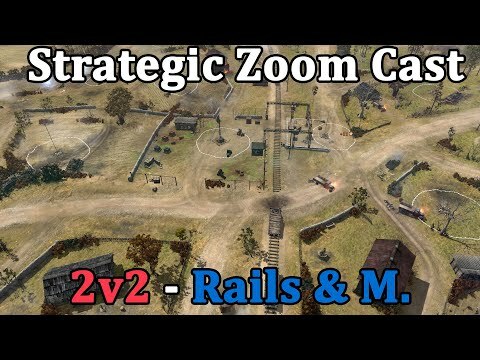 Today Coh2 problem as you mentioned, is too much indirect fire, too much long range TD sniping, too much snares, too much Allies Infantry blobbing. From late mid-games onwards, it becomes a war of attrition. There is little room for push and flanking. Unless you play 4v4, where you can still have enough resources, and bigger maps to make a combined push. I think for start, Relic should bring back infantry and vehicles armor, have a little RNG sparring, instead of too fast squad wipes or late tanks lasting 3-4 shots only. Another game decided by who has better sniping TD, who has better infantry blob(not wehr!) and indirect fire. I generally speaking agree with you but I think the DPS is in a good place right now. They devs have taken many active measures to reduce how quickly units can suddenly die. Think about old land mines and old demo charges. Units used to be able to die extremely suddenly and with almost no good counterplay, and those losses would often swing games. I think the devs have pushed the lethality of the game away from cheese and toward player decisions such as cutting retreat paths, which I will always argue should be a valid strategy. I also think we tend to look at vcoh with rose-tinted glasses when it comes to how "fair" the game was. Remember how easily infantry could just get run over by vehicles? And how there was no such thing as an anti-vehicle snare on nearly all basic infantry? Lets not even begin to discuss the oversaturation of artillery wiping units off the face of the planet. I think the choices you can make in order to survive as a commander in CoH2 are greater than what you could do in vCoH. I think lowering the DPS for the sake of increasing reaction times will mire the game and reduce the amount of early game and mid game victories players can achieve, and encourage players to select commanders that have late game powerhouse vehicles at their disposal. I get your concern but I don't think the game would be better if we pushed it in that direction.